Extech Instruments’ 42515–T Wide-Range InfraRed Thermometer with Type K input and added Bonus TP200 pipe clamp allows for instant, accurate readings, with up to 20 readings in storage capacity and can measure both non-contact and contact temperature, according to Extech Instruments. 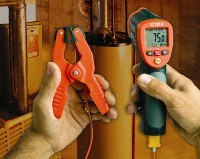 The Wide-Range IR Thermometer is ideal for HVAC/R applications, the company claims. It delivers a wide temperature range for InfraRed measurements from -58 to 1472°F (-50 to 800°C) as well as the Type K thermocouple measurements from -58 to 2498°F (-50 to 1370°C). The Wide-Range IR Thermometer is ideal for measuring the surface temperature of objects that are difficult to reach or unsafe to touch, the company says. Other features include a laser pointer for better aim and accuracy, auto-hold that activates when the measurement trigger is released, and switches built into the handle that allow for easy °C/°F display selection, auto power off and alarm on/off control.